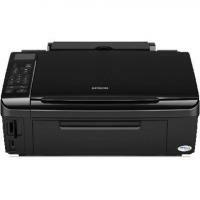 The Epson Stylus SX510W is all in one wireless printer that is capable of high quality printing and scanning. The printer dimensions are 450‎ x 342 x 182 mm (Width x Depth x Height). It is a lightweight printer as it weighs only 6 kgs that makes it an easily portable device. It has a large 6.3 cm LCD view that allows one to view, select and print the photos direct from digital camera's memory card without the need to switch on to PC. The printer is a simple in design terms and its user interface is easy to use.The printer has a printing resolution of 5,760 x 1,440 dpi and the print speeds can be as fast as 36 ppm both in case of monochrome and colour. It has a scanning resolution of 2,400 x 2,400 dpi. The print quality is high with Epson Stylus SX510W Ink Cartridges. One can save money with individual inks as there is need to replace only the colour used. The printer creates lab quality photos. The Epson Stylus SX510W is an impressive and affordable all-in-one printer. It prints very quickly and produces good quality photos and reasonable plain paper printouts. It is also very cheap to run, though Epson appears disingenuous in recommending lower-yield consumables, which will cost more. Q. Does this printer works well with compatible Epson Stylus SX510W Ink Cartridges? A. Yes. Compatible Epson Stylus SX510W Ink Cartridges work well with this printer. They provide the same quality output as the original cartridges. Q. What are the key features of Epson Stylus SX510W Printer? A. Epson Stylus SX510W Printer is a wireless printer which yields high-quality printing. This printer is not very costly and is suitable for home and small office work. Large LCD screen allows the user to print directly from memory card. This user-friendly printer has high speed and supports monochrome and colored printing both. Q. I want to buy Epson Stylus SX510W Ink cartridges in bulk for my office in Ireland. Do you provide deliveries for bulk orders? A. We do provide bulk order delivery. You can call 048 30833221 for checking our stock availability and further assistance. Q. Why there is unwanted marks on my document while printing? When printing is done on the wrong side. If the environmental condition specified varies than you may need to clean printer’s roller. When you use EPSON special media which is not supported by the printer. Q. Is this printer user-friendly? Can I install the printer and its driver by myself? A. You can easily install the printer and its driver by yourself. Follow the step by step procedure given in the manual. If any driver listed in the manual is not available in the CD provided then you can download it from the EPSON website. Q. What is your return policy to return faulty items back? A. If an item purchased from our site, fails to operate within 30 days of purchase simply call us on 048 30833221 or email us at info@printerinkcartridges.ie . Make sure that you provide us with invoice number and order details. We'll replace the product or refund once the item has been returned to us and tested. Q. Can I order a multipack of Epson Stylus SX510W ink cartridges as per my preference for the colours? I need 3 Magenta cartridges, 6 Cyan, 5 Yellow, and 8 black ones. A. Certainly. You can have your own combination of colours for Epson Stylus SX510W ink cartridges listed on the site. Please fill up the form here to order the cartridges as per your preference. Q. I am not able to install Windows 10 printer driver after connecting Epson Stylus SX510W printer to my computer. How should I resolve this issue? A. Please follow the steps given below to install the printer driver on Windows 10 OS. Q. I live near the outskirts of Belfast. Can you deliver Epson Stylus SX510W ink cartridges to remote areas or areas located out of the city centre? A. Yes. We do deliver products to areas located outside the city centre. The delivery of the products is done by Fastway Couriers that has an extensive delivery network in Ireland and Northern Ireland. As far as the remote areas of Belfast city are concerned, you can have a clarification with our customer support by sharing your address details. Nevertheless, if the delivery option is not available for your locality you can choose any other place in your city where you wish to receive the order.